Paleoamerican Origins, A Review of Hypotheses and Evidence. It is almost universally accepted that the first peopling of the Americas resulted from migrations before 11,200 B.P. from northeastern Asia via Beringia, the continental shelf between Asia and North America (Toth 1991:53). First peopling and Paleoamerican origins are important anthropological questions, with diverse theoretical models hinging on the location, origin and timing of migrations. Different and dissimilar hypotheses regarding Asian homelands, migration routes and migration timelines have been proposed. In this article, I will review first peopling hypotheses and evidence related to the question of possible Paleoamerican homelands. In particular, evidence from Siberia will be compared with North American evidence. The evidence can be broadly divided into the paleoenvironmental and three anthropological subdisciplines; linguistics, physical anthropology and archaeology. Language, biological traits, and material artifacts have all been studied to answer the question of Paleoamerican origins. These areas of evidence are largely independent. Linguists make inferences about the history of language groups and their relationships based on study of existing languages. The physical anthropological evidence includes studies of current and past populations, especially studies of dental morphology and genetic traits. The archaeological evidence focuses on comparisons of material remains primarily from the Americas, Siberia, and adjacent regions in Asia. A fundamental aspect of this question is the timeline of migration. The conflicting migration hypotheses propose different timelines. The timing of first peopling continues to be vigorously debated, and the different hypotheses affect questions regarding the plausible Asian homeland(s) and which Asian archaeological complexes can be considered ancestral. The most conservative views accept 12,000-year-old evidence (Late-Entry Model), and more liberal hypotheses propose entry by 25,000-40,000 years ago (Early-Entry Model). While some archaeologists once maintained that humans arrived in the Americas over 100,000 years ago, their purported evidence is today viewed as geofactual, not cultural. The main obstacles to broader acceptance of the Early-Entry model are dating questions and acceptance of the cultural origin of reputed artifacts (Bonnichsen and Schneider 1999:510). Meltzer (1995:22) cited 50 proposed pre-Clovis sites on a 1964 list that failed closer scrutiny as of 1988. Herein, I discuss sites that various authors continue to propose as plausible evidence of early entry, and I ignore those no longer in contention. I also ignore migration hypotheses that lack scientific support. My purpose is to review the hypotheses and evidence without entering the debate regarding their validity. A variety of migration hypotheses have been proposed, ranging from discrete to steady, from single to multiple, from successful to failed, from slow expansion into adjacent territory to rapid dispersal across vast landscapes, from coastal to interior or both, and, of course, from early to late. The number, form, timing, route, origin, and survivorship of migrations remain the subject of debate, and the anthropological community has no consensus on these issues (Rogers et al. 1992:292). Theories of multiple migrations are countered with arguments for isolating mechanisms in the New World, including the concepts of multiple ice-free refugia (Rogers et al. 1992:296) and population bottlenecks. "... leads to the following basic conclusions: (1) It did not occur prior to the terminal Pleistocene. (2) It was carried out by evolutionarily modern Homo sapiens sapiens. (3) It had its origin in migration from Asia via the Bering Strait. These views ... rest mainly on the absence of human skeletal remains earlier than the terminal Pleistocene, the biological resemblances between Amerindian and Asian populations, and the fact that human dental variation in the Americas is less than that in Asia, suggesting the relative recency of American settlement." "... the Americas were settled by three separate population movements whose identity can be most precisely expressed in linguistic terms as Amerind, Na-Dene, and Aleut-Eskimo." "dental morphology indicates that the Americas were colonized by small bands of Siberians whose genetic ancestry was with the evolving late Pleistocene Mongoloid population." "... The proximate homeland of Paleoindians was in northwestern Siberia, where several specialized stone tool traditions emerged from slightly different lifeways, on the Arctic steppe with socially gregarious herd animals, in the fish-rich patchy wooded river valleys, and along the ice-packed sea mammal-rich Okhotsk-Beringian coastal shelf." "Although it has long been assumed that the Americas were peopled in low numbers of discrete migrations, there is, as yet, nothing in the linguistic, dental, or genetic evidence to eliminate the alternate possibility of multiple migrations of more or less closely related groups, all of whom, of course, shared a northeast Asian origin." "... Determining the number and timing of migrations to America will require more data... The languages, teeth and genes of native Americans hold great promise for establishing who their early ancestors were. But 12,000 years or more after the fact, millennia during which human populations mixed and moved, particularly in the wake of post-Colombian demographic collapse, the lines originally joining or separating groups are easily snarled." "it is likely that people arrived in the Southern Hemisphere no later than 15,000 to 14,000 years ago." Laughlin and Harper (1988:26) consider the southern marine coast of Beringia habitable, and a likelier human habitat than the interior. They also note that the Yukon River emptied into the Bering Sea only a few hundred kilometers from the mouth of the Anadyr River during the glacial maximum. Goebel (1999:224) presents two alternative hypotheses for the peopling of Beringia and the Americas, one via the mammoth steppe before the last glacial maximum 25,000 to 20,000 years ago, and colonization during the last glacial maximum 14,000 to 12,000 years ago. Evidence in Siberia (discussed below) supports the view that around 25,000 years ago humans equipped with blade and biface technology moved onto the mammoth steppe in Siberia, an environment that extended to far eastern Beringia (Goebel 1999:224). In Goebels view the ecological factors did not favor colonization of Beringia until 17,000 years ago (Goebel 1999:225). This model is sufficiently early to support many proposed pre-Clovis sites. Derevianko (1978:70) states that the most favorable time for the penetration of man into America via Beringia was between 28,000 and 20,000 years ago. Derevianko (1978:70) also proposes several distinct migrations into America from Asia while acknowledging the probability that sites on the two continents are not likely to have full coincidence in forms and techniques of tool making. Mochanov (1980:129) hypothesizes only one Upper Pleistocene migration to the Americas, that of the Diuktai Culture, which reached central Mexico by 23,000 years ago, as evidenced by Tlapacoya, and two Holocene migrations, that of the Sumnaghi culture from the middle Lena River basin northeast after 10,500 years ago, and that of the Belkachi culture after 5,000 years ago. Rogers et al. (1992:281) attribute peopling of the New World to boreal cultural adaptation in the Old World, to the clothing (eyed bone needles, and, by implication, tailored clothing appear during the Upper Paleolithic), shelter, and fire that allowed humans to create a survivable microclimate. Citing (in Mochanov 1978a:62) the human occupation at UstMil II C, located near 62 degrees north and dated to before 35,000 B.P., Rogers et al. (1992:281) write "no plausible reason has ever been provided why these early populations would not have extended their range into the New World at least tens of thousands of years ago." Assemblages in Kamchatka, Sakha, central Siberia, and even Europe have been postulated as ancestral to the Paleoamerican assemblages. Dikov (1978:68) proposed Ushki I in Kamchatka. Mochanov and others propose the Diuktai culture. Turner (1985:32), reaching further back, proposes the North China Microlithic tradition as the best potential source of late Pleistocene eastern Siberian and Paleoamerican lithic traditions. Haynes (1987) proposed Eastern European and central Siberian assemblages as ancestral to Paleoamerican lithic traditions. Excepting Haynes, there is general agreement that the Paleoamericans derive from northeastern Asia. "...sometime between 13,000 and 12,000 B.P., an adventuresome band, perhaps still looking for megafauna, moved southward through an ever-widening corridor between the waning glaciers in search of game." The ancestral sites in this model include Kostenki, Sungir, Mezhirich, Dolni Vestonice, Afontova Gora, Kokorevo and Malta, with Kosteniki I level the closest in similarity (Haynes 1980:119). Haynes (1980:115) writes that Clovis Culture developed from one of two distinct lithic traditions in Beringia, "the one without microblades." "no obvious source for the early Beringian Complex can be identified in northeast Asia. The lithic technology and typology of the Nenana Complex bear limited resemblance to the microblade industries that were widespread in northeast Asia (including the Lena Basin, northern China, and Japan) between 15,000 and 10,000 yr. B.P., although elements (such as bifacial points and end scrapers) are present in some sites. Non-microblade industries in these regions, which typically reflect flake and blade core technology and contain side scrapers, end scrapers, retouched blades, and other generic tool forms, are generally dated to before 15,000 B.P." "The lithic assemblages in mid-latitude North America ... bear many similarities to those of the Nenana Complex and probably represent the same population." "it seems obvious that the makers of fluted points did not come from Alaska in the terminal Pleistocene. Any prehistorian intent on arguing otherwise must perforce explain why fluted points were transmitted southward with lightning rapidity, as if by people entering a completely uninhabited area, whereas numerous dominant elements of the same successful tool complex were transmitted in the same direction only over the course of several millennia, as if by migrants infiltrating an area already fully occupied." "If the Clovis people of North America, although substantially contemporaneous with the earliest Paleo-Arctic people of Alaska, were not derived from them, the implication is that Clovis culture developed in America south of the ice sheets from some ancestor already present." "...although the inhabitants of Beringia in the terminal Pleistocene are known, the nature of their culture does not permit an easy and conclusive articulation with their contemporaries in America to the south, whose earlier history remains in question." It is readily apparent that the migration hypotheses are often contradictory. Extinct Eskimo settlements in far north Greenland evidence human ability, both biologically and in terms of cultural adaptation, to settle near the pole (and the risk of extinction in that environment) (Laughlin and Harper 1988:18). Human migration to North America was environmentally possible any time in the last 60,000 years, well within all current hypothetical timeframes (Fladmark 1983:41). However, environmental conditions have fluctuated dramatically during that timeframe. Paleoenvironment evidence indicates when the Bering land bridge existed and when glaciation was an obstacle. Beringia was most extensive around 19,000 years ago (Laughlin and Harper 1988:24, Hoffecker, et al., 1993:46). The sea level, at that time, was 121 m (397 ft.) below the present day level (Hoffecker et al. 1993:46). The land bridge was open for all but a few thousand years between 30,000-25,000 and 10,000 years ago (Jennings 1978:3, Meltzer 1993:161). Coral reef analysis indicates that the sea level was 70 m lower 12,000 years ago (Hoffecker et al. 1993:46). Contemporary sea levels were established 6,000-5,000 years ago, the current general coastal form was established by 10,000 years ago, and the Bering land bridge was inundated after 14,000 years ago (Laughlin and Harper 1988:25), and possibly not until after 10,000 B.P. (Hoffecker et al. 1993:46). According to West (1996:551), the Bering land bridge was intact for over a millennia after the earliest dated sites in Alaska. Glacial maximums occurred around 14,000, 30,000, 42,000, and 55,000 years ago, with a land bridge available for periods of from about 5,000 to 10,000 years during each maximum (Hoffecker, et al., 1993:46, Jennings 1978:5, Meltzer 1995:37). There is little dispute about these ideas. Debate continues about the extent of glaciation on the Pacific coast, the existence and utility of a corridor between the Cordilleran and Laurentine glaciers, and the degree to which glaciation posed an obstacle to migration. The Pacific coast may have been passable before and after glacial maximums. Fladmark (1983:38) suggests that the Mid-Wisconsinian nonglacial interval from 60,000 to 25,000 B.P. was a period when glaciation did not represent a significant barrier, and that the southern Cordilleran glaciers did not cover their final 100-200 km until between 17,000 and 14,500 B.P. Fladmark (1983:38) also posits that a chain of coastal islands, headlands, and uplands remained glacier-free, and that possible glacial barriers occurred only on the Alaska Peninsula. Fladmark (1983:41) concludes that the post-14,000 B.P. period, with climate milder than in the previous 40,000 years, "seems particularly attractive as a time for midcontinental human population expansion into and through the New World.," and, that "on the Pacific Coast, more mesic environments may have permitted greater cultural flexibility within the overall limitations of generalized littoral-maritime adaptations." There is debate about the environment of Beringia. Palynological data supports a scenario with grasses, sedges and sage during the glacial maximum, followed by an increase in dwarf birch beginning between 14,000 to 12,000 B.P. (Hoffecker et al. 1993:47). The debate centers on the mammalian community and the number of animals that the ecology supported. Even if the environment supported a rich mammalian megafauna, humans in the arctic steppe environment may have been limited to areas with wood for fuel during the cold seasons. Rogers et al. (1992:296) argue that forest vegetation did not appear in the Alaskan interior and the ice-free corridor until after the appearance of Clovis, a factor arguing against a Clovis Culture migration in the ice-free corridor. Another aspect of the paleoenvironment is climatic variation due to topography and proximity to oceans. Climatic extremes are buffered in coastal areas by the warmer temperatures and sheer mass of the ocean, and these areas are not subject to the marked seasonality of continental climates. Rogers et al. (1992:291) write, "the coast would provide the pathway of least technological resistance to Ice Age people.... it would be the likely route of earliest entrance." Evidence of possible Ice Age migrations along the coast would have been impacted by rising sea levels, so this hypothesis cannot be easily tested archaeologically. Linguistics has several limitations when investigating temporally remote populations. Linguistics cannot provide precise chronologies. Given a baseline accepted time depth of at least 12,000 years ago, the Paleoamerican language macro-group (termed Amerind) is beyond the limits of glottochronology (Greenburg, et al., 1986:480). Languages, unlike genes, are not biologically inseparable from populations, and separate species, if you will, can latter recombine. Because an unknown number of language families may have been lost in the past twelve or more millennia, linguistics, at best, provides an "x plus n" solution to the question of the number of languages. Because this article focuses on evidence of first peopling and hypothetical Asian homelands, linguistics is the least important of the three categories of anthropological evidence. The greatest utility of linguistics in Paleoamerican studies has been in distinguishing the Paleoamerican and later migrations, and in defining the number of migrations that the current surviving languages evidence. Linguistics also has utility as part of a suite of evidence, providing independent corroboration of studies in other fields. A basic premise of linguistic studies is that language divergence is a temporal function and that areas with the greatest linguistic diversity have been occupied longer. Linguists have noted that no Amerind languages currently exist in Asia, Alaska and the Yukon (West 1996:553). Greenberg (1996:529) concluded that Eskaleut, Na-Dene, and Amerind are not branches of the same original language stock and, hence, did not differentiate in the New World. Underlying this conclusion is the Late-Entry assumption. Of course, other factors also impact language distribution. Rogers et al. (1992:293) point to an apparent relationship between the isolating role of Pleistocene biogeographic zones and distributions of Native American linguistic groups. The distribution in relation to glaciation of native North American languages in most of Canada and northern parts of the United States has been studied by Rogers and others (cited in Gruhn 1987). The glaciated regions averaged, per million square miles, only 18 languages, compared to 52.4 in the unglaciated regions (Gruhn 1987:78). Most of the deglaciated area is occupied by only three language groups, two of which are not Amerind groups. "the model of earliest peopling via the coastline of North America fits the evidence of language distributions...much better than does the model of interior peopling via the ice-free corridor.... There is simply no linguistic evidence in support of the notion that interior North America or the Great Plains were the earliest populated zones; indeed the linguistic evidence...indicates a relatively late expansion into these areas from the south." Unlike linguistics, which is dependent on present-day evidence to make inferences about the past, physical anthropology utilizes direct evidence of the past, as well as studying existing populations. Here also, there are limitations. At least from a theoretical perspective, migration models and bioarchaeological studies that compare American and Asian peoples must account for the fact that gene exchange across Beringia has been possible in both direction during the entire occupation of the Americas (Meltzer 1993:165). Divergence of genetic traits does not necessarily correspond to, and may long precede, population divergences and migrations. Genetic traits can disappear in homelands after migration of the founding group(s). Also, with regard to Paleolithic remains, the amount of evidence is very limited. The oldest human skeletons in the Americas are dated to after 10,500 B.P. (Taylor 1991:102). Lack of older skeletal remains cannot be taken as proof of Late-Entry. Negative evidence in archaeology is often short-lived. Dental morphology provides evidence of northeast Asian and American population relationships. Teeth have very good preservation, hence dental studies have the advantage of available prehistoric evidence. Dental crown, root, and shoveling traits represent at least two dozen separate epigenetic systems, and, therefore, are a useful tool in determination of prehistoric population genetics and relationships (Turner 1985:313). According to Turner, all Native American populations have teeth more like those of northeast Asians than like those of any other world population (Turner 1994:131). Turners (1994:131) dental study of more than 15,000 crania indicates that, sinodonty, one of two major global dental clusters is represented by Native Americans and Northeast Asians. Turner (1985:37-49) suggests that the sinodonty pattern is 20,000 to 40,000 years old. Meltzer (1993:164) points out that Turners dental studies "required a number of assumptions, among them that regions are marked by distinctive languages, artifacts, and teeth, and these have isomorphic distributions that are stable over time, and uninfluenced by gene flow." Szathmary (1986:410) comments that Turner "interprets his analytic results in the light of a preexisting hypothesis that he simply assumes to be true." Szathmary (1986:411) also comments "postulation of the precise number of waves is an exercise in hypothesis generation." Malta, Kostienko, Sunghir and other central European and central Asian Upper Paleolithic peoples have no dental relationship to Amerindian populations (Turner 1985:32), and, as such, present a hypothetical western homeland boundary. This boundary lies in the neighborhood of Lake Baikal. A similar hypothetical southern boundary may also be defined between sinodonts in northern China and eastern Siberia and the sundadont dental pattern, which prevails in southern Asia. Molecular paleoanthropology provides evidence based on morphological data from skeletal remains and from living populations. According to Wallace and Torroni (1992), the three native American linguistic groups carry four mtDNA haplogroups, with each group characterized by a unique set of mutations. The same variants are found in East Asian and Siberian populations, indicating a shared line of descent (Gibbons 1996:31). Wallace and Torroni (1992:403) estimated the Paleoamerican radiation at 21,000 to 42,000 years ago and, more recently, at about 19,000 to 38,000 years ago. Different analytical techniques on different mtDNA sequences have produced different results, with radiation times as great as 41,000 to 78,000 years ago, or potentially within Clovis times (Schanfield 1992, Torroni, et al. 1993, Wallace and Torroni 1992). Schanfield (1992) compared immunoglobulin allotypes of 28,000 Amerindians with Asian populations. GM haplotypes evidence at least four migrations of Asians, with the first migration between 17,000 to 25,000 years ago (Schanfield 1992:381-397). Wallace and Torroni (1992:403) compared mtDNA in Amerindian and Asian populations, and concluded that the American mtDNA populations descended from five Asian mtDNAs that cluster in four lineages and, that the Amerindian mtDNAs arose from one or maybe two distinct Asian migrations about four times older than the Na-Dene migration. They placed the age of the four Amerindian lineages at 21,000 to 42,000 years ago. Torroni, et al.s (1993:591) study of 411 individuals in 10 Siberian populations concluded that migration occurred between 17,000 and 34,000 years ago. "Recent findings in studies on the peopling of the Americas have caused even staunch Clovis First supporters like myself to reconsider their positions. A probable pre-Clovis age for Monte Verde in Chile and reports by geneticists and linguists that human populations may have migrated to the Americas as early as 35 kya seem to demand a rethinking of Pleistocene peopling models." The evidence provided by archaeology is often disputed, particularly with regard to early entry dates. Of course, dated sites are considered minimalist indications of actual antiquity. There is considerable radiometric evidence, albeit disputed in its interpretation, that modern humans occupied the Americas before 12,000 years ago (Adovasio et al. 1978, Adovasio et al. 1988, Adovasio et al. 1990, Bennett 1986, Borrero 1996, Byran and Tuohy 1999, Green 1962, Holen 1996, Holmes et al. 1996, Lorenzo and Mirambell 1999, Miller 1982, Wychoff et al. 1990). The dating of Monte Verde in Chile, the most widely accepted pre-Clovis site in South America, is between 12,500 and 13,000 B.P., with one date of 13,565 (Dillehay 1989). Paleoamerican lithic assemblages are well known. The Clovis complex of the Paleo-Indian tradition is the most widespread cultural complex in North America. Clovis and Clovis-like points are found throughout North America. This industry lacks microcores and microblades and is characterized by flake and blade core technology, bifacial projectile points (predominantly lanceolate fluted points), end scrapers, side scrapers, gravers, and rarely burins (Hoffecker et al. 1993:51). Microblade technology did not spread outside of the northern regions in North America during Paleo-Indian times, and only extended to the Pacific Northwest much later in time. In the late 1950s radiocarbon dating at the Lehner site in Arizona dated Clovis to 11,250 B.P. (Haury, et al., 1959). Haynes dated Clovis culture to 11,000 to 11,500 B.P., based on 40 radiocarbon determinations from seven sites (Rogers, et al. 1992:286), while AMS dates and reanalysis of old Clovis dates from key sites cluster between 11,200 and 10,900 B.P. (Hoffecker et al. 1993:51). Sites proposed as evidence of a pre-Clovis horizon in North America include Meadowcroft Rockshelter (Adovasio et al. 1978:156), Cactus Hill, Fort Rock Cave (Bryan and Tuohy 1999:256), Wilson Butte Cave, Old Crow (Jennings 1978:22), Burnham (Wychoff, et al. 1990), Tlapacoya (Lorenzo and Mirambell 1999), Ed Cedral (Lorenzo and Mirambell 1999), Lovewell (Holen 1996), False Cougar Cave, La Sena, Owl Cave (Miller 1982), Lubbock Lake (Green 1962), and others. Jennings (1978:23) points to similarity between the artifacts found in the Old Crow area, Fort Rock, Wilson Butte, and Clovis sites. Meadowcroft bifaces, blades, and retouched flakes are more or less duplicated at Blackwater Draw, Lindenmeier, and many other fluted localities (Adovasio et al. 1978:178). General resemblances are also seen with Wilson Butte Cave, Idaho (Adovasio et al. 1978:178). According to Adovasio et al., the bifacial lanceolate point from Meadowcroft is morphologically similar to points from the basal stratum of Fort Rock Cave, Ventana Cave, Levi, and Bonfire Shelter, and appears to be ancestral to both fluted and unfluted points in later Paleoamerican traditions. Adovasio et al. (1990) contend that Meadowcroft Rockshelter has produced six AMS dates that have clear, undeniable and extensive artifact associations, and average at about 14,250 B.P. The earliest American claims include Tlapacoya, Mexico, where a prismatic obsidian blade and presumed hearths associated with animal bone middens were dated to between 24,000 and 21,000 B.P. (Lorenzo and Mirambell 1999). El Cedral, Mexico, produced a charcoal lens ringed with proboscibian tarsi, a circular scraper, and six other hearths, all dated to between 38,000 and 21,000 B.P. (Lorenzo and Mirambell 1999). 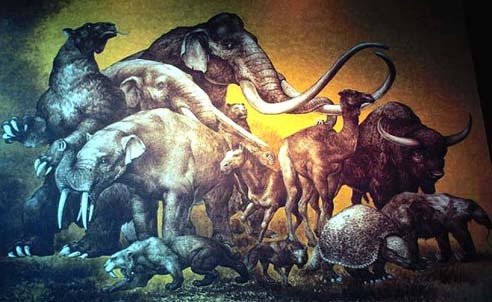 The La Sena mammoth kill site in Nebraska has produced 18,000 B.P. dates from bone collagen (Bonnichsen and Turnmire 1999:12). The Cactus Hill site in Virginia produced a charcoal concentration with quartzsite flakes and quartz core blades AMS dated to 15,070 B.P. And a blade cluster associated with a soil sample dated to 16,670 B.P. (Bonnichsen and Turnmire 1999:16, Goodyear 1999:435). False Cougar Cave, Montana, produced human hair from below a 10,530 B.P. date, and believed to be from a level dated at 14,590 B.P. (Bonnichsen et al. 1996:267, Frison and Bonnichsen 1996:311). Other sites antecede the Clovis horizon by only a few thousand years. Radiocarbon dates between 13,200 and 11,340 B.P. are reported for Owl Cave, Idaho (Miller 1982), Lubbock Lake, Texas (Miller 1982), Fort Rock Cave, Oregon (Bryan and Tuohy 1999:256), and the Mill Iron Site in Montana (Haynes 1987:85). Evidence supports non-fluted, regional traditions south of the glacial ice prior to and contemporaneous with Clovis points. The Goshen cultural complex at the Hell Gap site in southeastern Wyoming has dates as early as 11,400 B.P. (Adovasio and Pedler 1997:574). A radiocarbon date, from the Mill Iron Site in southeast Montana, on charcoal associated with "well-made, concave-based, bifacial projectile points that are neither fluted nor Clovis in style" produced a date of 11,340 B.P. (Haynes 1987:85). Stemmed lanceolate points were in use in the Basin and Range physiographic province by 11,500 B.P., while available dates indicate that fluted points were not in use in the Great Basin until after 11,250 B.P. (Bryan and Tuohy 1999:255). Other North American Clovis co-traditions include Mesa, Denali and Nenana in Alaska (all discussed below), and Chesrow in Wisconsin. There are few claims for very early dates in Eastern Beringia (presently Alaska and parts of Yukon Territory). Bluefish Caves, Yukon, contains cultural materials, including lithic artifacts, bone alteration from butchering, bone tools and examples of bone reduction by flaking (Cinq-Mars and Morlan 1999:203). A mammoth bone flake and its core were studied, and Cinq-Mars and Morlan (1999:205-206) concluded that the bone evidences butcher marks and fresh-state fracture, and that the flake was reduced bifacially and diagonally in a step-by-step ordered sequence. The bone collagen and flake were AMS dated to an average age of 23,500 B.P. (Cinq-Mars and Morlan 1999:205). The radiocarbon dates from Bluefish Caves are considered reliable. The relation between the age of the bones and the time of their use as artifacts is questioned by Late-Entry advocates (Hoffecker, et al. 1993:50). The earliest dates for American Beringia tool complexes are near 12,000 B.P. (West 1996:544). There are no Clovis sites in Alaska, nor are mammoth kills evidenced (Meltzer 1995:24, Yesner 1996:248). No Clovis points are found in Siberia (Bonnichsen and Turnmire 1999:2). All the radiocarbon dates for the fifty fluted points found in northern Alaska date after the Clovis horizon (Hamilton and Goebel 1999:180-181). The oldest Alaskan sites date to just before Clovis dates. At least three distinct lithic complexes appear in the Alaskan archaeological record at approximately the same time, between 12,060 and 11,660 B.P. The earliest firm evidence of human occupation is in the Tanana Valley in Alaska. At the Broken Mammoth, Swan Point, Mead, and Healy Lake sites, the oldest dates range between 12,060 B.P. And 11,410 (Cook 1996:327, Hamilton and Goebel 1999:156-157, Holmes 1996, Holmes, et al. 1996). The oldest stratified sites in the Nenana Valley region date to from 11,820 to 11,010 B.P. (Hoffecker et al. 1993:48, Goebel 1999:224). The Mesa complex in northern Alaska dates to 11,660 B.P. (Kunz and Reanier 1996:502). Bifacial points are known in all three complexes. Current available data supports the view of a projectile point horizon without microblades in Alaska. Clovis and other mid-latitude Paleoamerican complexes lack microblade technologies. Until recently, available data supported the view that the early projectile point horizon without microblades in Alaska was not contemporaneous with a microblade tradition. Recent dating of the microblade tradition in the Denali complex to before 11,000 B.P. suggests contemporanity of these cultural complexes "that derive from rather different cultural traditions" (Ackerman 1996:460). Goebel (1999:224) considers the Nenana industry in Alaska similar to the Siberian middle Upper Paleolithic industries, while recognizing the temporal gap between these expressions and the formidable environmental barriers separating them. The Nenana complex produced a blade-and-biface assemblage that emphasizes triangular and tear-drop shaped points, and lacks microblades (Ackerman 1996:460, Hamilton and Goebel 1999:157). Dry Creek, the first deeply stratified site in Alaska with a radiometrically-dated Pleistocene assemblage, lacks microblades in the earliest component (Hoffecker et al., 1993:48, 1996:347-352). Lithics from the lowest levels at Walker Road do not evidence microcores or microblades (Hoffecker et al. 1993:48). The lowest assemblages at Owl Ridge lack microblades (Hoffecker et al. 1993:48, Hoffecker 1996:364). The Moose Creek site lacks microblades (Hoffecker 1996:364). Healy Lake Village produced Pleistocene-early Holocene occupation evidence (11,410 to 8,210 B.P.) from at least 12 sites on Healy Lake (Cook 1996:323). Healy Lake, the type site of the Chindadn complex, dates to 11,410 B.P. (Cook 1996:325-327). The diagnostic artifacts of the Chindadn complex, very thin, bifacially flaked blades or knifes with a teardrop outline, have been associated with the Nenana complex (Cook 1996:325). There are no microblades in the Chindadn levels of the site (Cook 1996:327). Meltzer (1993:167) concludes that the Nenana complex in Alaska, a complex without microblades, is the progenitor of the Clovis complex. The Denali complex includes wedge-shaped cores and microblades that are clearly of Siberian derivation (Kunz and Reanier 1994:660). Hoffecker et al. (1993:48-49) (citing Dumond 1980, West 1981 and Mochanov 1980) characterize the Denali Complex as "a regional and temporal variant of a microblade industry that was widespread across northern Asia and northwestern North America in the Late Pleistocene and Early Holocene." West, who proposed the complex in 1967, characterized the lithics as "wedge-shaped microblade cores of a complex and highly consistent form, multiple burins on flakes,... side scrapers and end scrapers of distinctive form, large blades, bifacial knives, boulder chip scrapers,... and the several products of core, blade and burin manufacture" (West 1975:76). At many Alaskan sites Denali complex lithics (with microblades) are superimposed over Nenana complex lithics after 10,700 B.P. (Hoffecker et al. 1993:50), and other sites evidence the contemporanity of the two complexes (Holmes 1996:322). Other sites in many parts of Alaska, such as Trail Creek Caves, Onion Portage, Ugashik Lakes, and Ground Hog Bay, evidence the spread of microblade technology after 10,700 B.P. (Hoffecker et al. 1993:50). Assemblages assigned to the Denali Complex at Dry Creek and Panguingue Creek date between 10,690 and 7,230 B.P. And include highly diagnostic wedge-shaped microcores and microblades (Hoffecker et al., 1993:49). The Swan Point microblades represent the oldest, solidly-dated microblades in eastern Beringia (Holmes 1996:322). Swan Point artifacts in the oldest stratum (11,660 B.P.) include microblades and microblade core preparation flakes, blades, dihedral burins, red ochre, pebble hammers, split quartz pebble tools, and culturally worked mammoth ivory (Holmes, et al. 1996:321). There is evidence of a microblade industry in the lower levels (9,310-11,800 B.P.) of the Broken Mammoth site, where retouched flakes, scrapers, point fragments, burins, microblades, small, wedge-shaped microblade cores, and a lanceolate point were found (Holmes 1996:317). West contends that the Denali complex is directly derivative of the Diuktai complex in Siberia (West 1996:547). Mochanov (1978a:65) defined the "Diuktai" typology (and distinguished it from the other major typology in Siberia, the "Malta-Afantovo") as a typology of wedge-shaped cores, microblades and bifaces. (Browman (1980:117) considers the Denali complex in Alaska and the Diuktai materials to be "extremely closely related" and a demonstration of "renewed cultural contacts" between Asia and America. The Spein Mountain, Mesa and Putu site complexes lack microblades and are all characterized by lanceolate bifacial points, scrapers, flint knives, gravers and notches, a complex of features not unlike Paleo-Indian site complexes (Ackerman 1996:460). The Mesa site (9,730-11,660 B.P. ), in northern Alaska, produced 80 projectile points (Kunz and Reanier 1996:500). Eighty percent of the tools at the Mesa site are bifaces. The basally concave lanceolate projectile points display basal thinning, although not true fluting, and heavily ground proximal edges and bases (Kunz and Reanier 1994:660). A single complete biface has bipolar fluting. Other tools in the assemblage include bifaces, spurred gravers, scrapers, and hammerstones, without evidence of core and blade technology (Kunz and Reanier 1994:660). Kunz and Reanier (1996:503) state that the Mesa complex fits comfortably within the technological and temporal parameters of the Paleo-Indian tradition and remains unique unto itself. The complex is most similar in technology to the Agate Basin and Hell Gap points of the high plains, but with basal concavities like the Goshen and Plainview points (Kunz and Reanier 1994:660). According to Ackerman (1996:460), the origin of this distinctive Alaskan site is as yet unknown. The Spein Mountain site complex, in southwestern Alaska, also lacks microblades, and its lanceolate points resemble the Mesa site and the Bedwell complex at the Putu site, both in northern Alaska (Ackerman 1996:460). Spein Mountain dates between 11,660 and 9730 B.P. "...the site yielded the bases of two unequivocal fluted points of obsidian and chert, and more highly fragmented pieces of others; lanceolate points; at least one triangular chert specimen reminiscent of the Chindadn points from Healy Lake; numerous burins and flakes reminiscent of the Denali Complex or Paleo-Arctic tradition, and relatively large discoidal and ellipsoidal bifaces reminiscent of the same; scrapers; and numerous cores and blades." "...this data is used to support the contention that fluted projectile points were borrowed from the north by Clovis hunters, or were carried by them from the north to the Great Plains as they entered the New World heartland at the close of the Pleistocene." "Any such conclusion seems premature at this point, however, given the overall ambiguity of the dating evidence for Alaskan fluted points." According to West (1996:542), no credible evidence of modern human occupation in Siberian Beringia predates the Upper Paleolithic. Middle Paleolithic populations are evidenced only in the southern portions of Siberia. Middle Paleolithic industries in Siberia (dated to 70,000 to 40,000 years ago) are distinctly Levallois and Mousterian, reduction technologies are uniform, secondary reduction is largely unifacial with few bifacial retouched pieces, assemblages consist of scrapers, denticulates, notches, knives, and retouched Levallois flakes and points, and there is no evidence of bone, antler or ivory technology, or of art or personal adornment (Goebel 1999:213). Teeth from Okladnikov and Denisova caves have been attributed to Neanderthals (Goebel 1999:213, citing Turner). The Mousterian flake and simple biface industry that characterizes the Middle Paleolithic, wherever found with human remains, is found with Neanderthals, and wherever Aurignacian is found with remains, it is found with modern humans (West 1996:542). The transition to the Upper Paleolithic coincides with the appearance of modern Homo sapiens. Early Upper Paleolithic sites in southern Siberia, found below 55 degrees latitude and dated from 42,000 to 30,000 B.P., correspond to the Malokheta interstade, a relatively warm interval in the mid-Upper Pleistocene (Goebel 1999:213). Subprismatic blade and flake primary reduction technology characterizes the lithic industry, and microblade cores are absent (Goebel 1999:216). The Siberian Upper Paleolithic lithic assemblages evidence unifacial and bifacial (typically leaf-shaped or oval) blades, retouched blades, end scrapers, side scrapers, gravers, angle burins, points on blades, backed blades, denticulates, and notches (Goebel 1999:213). Bone, antler and ivory technologies appear, with antler points, bone awls, cut-and-polished ivory and bone retouchers, well-made bone art, and bone and antler handles for stone tools (Goebel 1999:213, Ikawa-Smith 1982:25). Mochanov (1978a:65) concludes that the Upper Paleolithic has the same antiquity in northern Asia as in Europe and the Near East. The Beringian Tradition represents the original peopling of Beringia and all the Paleolithic sites in the time frame from 35,000 to 9,500 B.P. (West 1981, 1996:549). Mochanov defined, principally from sites on the Aldan River, a variant of the Siberian Upper Paleolithic tradition, the Diuktai culture, which he views as dominating all of eastern Siberia during the Late Pleistocene (Dumond 1980:988). Mochanov (1978:65) interprets the roots of the Diuktai complex as going back to the Levalloiso-Aucheulean cultural stratum in Asia. The Diuktai Cave research delineated northeast Asias characteristic core-and-blade and biface industry in context with late Pleistocene megafauna. Diuktai Cave produced numerous flaked tools, including bifacial willow-leaf and subtriangular spearheads and oval knives (Mochanov 1980:122). The Diuktai Culture, a culture of hunters of mammoth, woolly rhinoceros, bison, horse, musk oxen and reindeer, is characterized by bifacial, willow-leaf, lancet-shaped, and subtriangular flint spearheads, as well as oval and semilunar knives, accompanied by end scrapers, burins, choppers, mammoth tusk spearheads, bone needles, wedge-shaped cores, and flint blade points (Mochanov 1980:123). The Diuktai Culture existed in northeast Asia from 35,000 to 10,500 B.P. (Ikawa-Smith 1982:25). Mochanov includes Hokkaido and Sakhalin Islands in the east Asian Diuktai Tradition. The Diuktai variant is represented at Angara, Amur, Indigirka, Kolyma, Kamchatka, Kukhtui, as well as other sites in Asia from the southern Urals to Mongolia and China, in Japan, and in North America (Mochanov 1978a:65). "it does appear that western Beringia was occupied by Upper Paleolithic folk by 35,000 years ago and that their equipage included essentially the same artifact forms that would characterize the entire 25,000-year span of this Diuktai variant of the Beringian Tradition." "If there can be said to be a special character to this western Beringian Upper Paleolithic pattern, it is, in part, the low incidence of implements made on blades and the virtual ubiquity of microblade technology." As is also seen in eastern Beringia and mid-latitude North America, a non-microblade complex proceeds the diagnostic Diuktai wedge-shaped microcore and microblade technology. The origin of the wedge-shaped core and microblade technology are unclear (Goebel 1999:218). Some of the earliest wedge-shaped cores and microblades are found in the Aldan basin in Yakutia, at Ikhine 2 (possibly 35,400 to 23,500 B.P.) And Verkhne-Troiskaia (Mochanov 1978a:62, Goebel 1999:218). Microblades may date to 19,000 years ago in the Angara valley, 18,000 years ago in the southern Transbaikal, and 16,500 years ago in the Yenisei (Goebel 1999:219). The earliest unequivocally dated microblade industry is in the Baikal region at nearly 18,000 years ago at Ust-Menza and possibly 19,000 years ago at Krasnyi-Iar (Goebel 1999:219). Bifacial technologies are most prevalent in Yakutia and the Russian Far East (Derevianko 1988, Goebel 1999:219). The assemblages at Mal'ta and Buret on the Angara represent a recognizable regional tradition once dating to about 18,000 to 15,000 years ago (Ikawa-Smith 1982:25). More recent renewed field study produced radiocarbon dates for the main cultural layer at Mal'ta, the type site of the "classic" Upper Paleolithic culture of the Siberian mammoth-steppe, of 21,000 and 20,0700 B.P. (Goebel 1999:216). The materials consist of bifacially-chipped projectile points and knives, wedge-shaped microblade cores, disk-shaped cores, Levallois cores, blades, microblades, and burins, often in association with Pleistocene megafauna (Dumond 1980:988). Siberian middle Upper Paleolithic sites evidence substantial dwellings with central hearths and storage pits that may represent permanent settlements (Goebel 1999:216). Bifacial chopping tools, large scrapers, bone tools, eyed needles, and points are known from the Yenesei Basin in sites dating to 20,000 B.P. (Ikawa-Smith 1982:25). Twelve stone artifacts from UST-Mil II-C (30,000 to 35,000 B.P.) include Diuktai Paleolithic complex wedge-shaped cores and bifacial knives and speartips in association with mammoth, rhinoceros, bison and horse (Mochanov and Fedoseeva 1996b:177). Bifacially worked tools appear in the Aldan drainage at the Ezhantsy site about 35,000 B.P. (Mochanov 1978a:65). The Diuktai people began making bifacially-worked spear points by at least 18,000 B.P. (Mochanov 1978a:65). Bifacial flint spearheads and knives are known from the Troitskaya sites in deposits dated to 18,300 to 17,680 B.P. (Mochanov 1980:123). Early human sites in the Americas south of the glaciers have produced spearheads, knives, end scrapers, large blades, choppers and bone points, resembling the Diuktai tool assemblage, but not microblades (Mochanov 1980:127). The evidence for human activity in Siberia is scant during the glacial maximum, 19,000 to 18,000 years ago. The recolonization of Siberia is by populations with the wedge-shaped core and microblade industry. There is a chronological dichotomy between the premicroblade and microblade industries in Siberia, Beringia and the Pacific Northwest coast. The earliest archaeological sites in far northeast Asia date from near 14,000 B.P. (Goebel 1999:224). Two stratified Pleistocene sites have been reported in western Beringia, Berelekh and Ushki. Berelekh, the northernmost Diuktai and Upper Paleolithic site in the world, at 70° 24 N, evidences human activity on the mammoth steppe. Mammoth debris at the site has been dated to between 13,420 and 12,240 B.P. (Hoffecker, et al., 1993:50). However, the artifacts are associated with remains of modern species and the artifacts do not conform to the diagnostic types of the Siberian and Beringian microblades industries, hence Hoffecker et al. (1993:50) conclude that the site was occupied after 12,000 B.P. The Ushki site is located in central Kamchatka, at a more southerly latitude (57 degrees) than the Beringian sites discussed above. Ushki I, Level VII, dated to 14,300 to 13,600 B.P., evidences two large dwellings covering 100 sq. m and 75 sq. m, stemmed arrow points, spearheads, bifacial knives, scrapers, cores, stone beads, and pendants (Dikov 1978:68). The fifty stemmed projectile points are the earliest bifacial stemmed points in Eurasia and are considered by Dikov (1996:250) as similar to the stemmed projectile points in North America. Dikov has characterized this level as "Paleo-Indian," with a genetic relationship to stemmed points at Marmes Rockshelter, Washington. Dikov (1996:244) views Ushkis Level VII occupation as representing "an entirely different Paleolithic culture" than the later Ushki material. The stratigraphy of Ushki is very clearly unmixed, with volcanic ash layers separating the levels. Ushki Level VI contains wedge-shaped microcores, microblades, bifacial knives and burins dating to 10,860 to 10,360 B.P. (Hoffecker et al. 1993:50-51). Dikov (1978:68) equates the later levels at Ushki with Alaskan sites. He proposes two ethnic waves from Asia to America, the first being the Paleo-Indian without microblades and the later a proto-Aleut-Eskimo with microblades. "There is still a considerable discrepancy between known Upper Paleolithic sites on both sides of the Bering Strait. Thus, today it is more expedient to speak about the common tendencies in the development of some stone working technologies in North Asia and North America and to outline their regularities.... At present it is impossible to delimit a single vast cultural community in North Asia. Moreover it will always be difficult to discover early sites and cultures that are identical in lithic technology and tool types. We believe that archaeologists studying ancient cultures in Siberia and North America should use a common methodology to distinguish standard indicator elements, which would play a decisive role in defining similarities and differences between Old World and New World complexes and cultures." "Clearly, some definite unity in lithic technology and culture does arise in Eurasia and America by the end of the Upper Paleolithic. This happened because of human adaptation to changing ecological conditions over this vast territory." The earliest level at Ushki and the Alaskan sites evidenced slightly later, around 12,000 B.P., indicate that regional differentiation existed in Eastern Beringia by that time. There are at least four distinct lithic complexes and some variants. One method of assessing the hypotheses for first peopling and the Paleoamerican homeland is to examine if the different approaches, archaeology, linguistics, environmental studies, and biological studies, produce evidence that converge on the same answer. The archaeological evidence, taken as a whole, presents a clear picture of Upper Paleolithic Siberian complexes similar to North American complexes, and developing before them. The Siberian material is definitively ancestral to the North American. However, the picture is complex, with a wide temporal window of possibility and diverse potential ancestral homelands in Siberia. Ecological and linguistic data point to the coastal route as most likely. GM haplotypes evidence at least four migrations of Asians, with the first migration between 17,000 to 25,000 years ago (Schanfield 1992:381-397). Using mtDNA haplogroups Wallace and Torroni (1992:403) estimated the Paleoamerican radiation at about 19,000 to 38,000 years ago. The Diuktai people began making bifacially-worked spear points by at least 18,000 B.P. (Mochanov 1978a:65). A closer resemblance exists between later Diuktai sites and early assemblages in Alaska than is seen between other North American sites and Diuktai. The Diuktai material represents a long enough time span to fit all early entry models with similar assemblages. The Paleo-Indian non-microblade tradition probably derives from Asia at an earlier date than the Denali complex. Gaps in the trail of evidence are obvious. The complexity seen in Alaska at the earliest horizon, with several lithic complexes appearing at the same time, and in North America at the dawn of Clovis culture, is coincidental with sea level rise and the inundation of a vast territory in Beringia and the coastal margins of Asia and North America. This sudden appearance of complexity of cultural traditions, and the lack of evidence of human presence before 12,000 B.P. in many parts of North America should be considered in light of the Pleistocene shoreline and the greatest environment and global climate change episode since the end of the Samganon interglacial. Much of the evidence related to this question is probably inundated. During the last glacial maximum human populations may have been restricted to ocean margin refugia. This would explain the apparent Diuktai repopulation in Siberia. Between the glacial maximum and the rise of sea levels sufficient time elapsed for the cultural differentiation evidenced in the archaeological record at Ushki, in Alaska with the Nenana, Denali, Mesa and other complexes, and in mid-latitude North America with the regional cotraditions of the Clovis horizon. If the homeland of the Paleoamericans is currently inundated, it is quite possible that the actual homeland is not a specific locality or valley, but rather an ecological zone, the Pacific Ocean margin during the last Ice Age. New, far more complex models of the first peopling of the Americas are needed in light of the complexity of the current evidence and the great gaps in the evidence. There can be little doubt that the Paleoamerican roots are in Western Beringia sometime after 35,000 B.P. By about 25,000 B.P. the cultural assemblages of Beringia evidence the cultural adaptations necessary to colonize the northernmost latitudes of the Pacific Beringian coast and possibly the mammoth steppe. After the glacial maximum there is a transition in Siberia to the microblade lithic assemblage, and the Paleoamerican homeland during this period should be sought elsewhere. The Early-Entry advocates will look in America. The Late-Entry advocates will look in Asia. I suspect that gaps in the evidence could be filled, and difference in opinions resolved, if we had access to the evidence that was inundated over 300 feet below sea level at the end of the Ice Age. APPENDA: Radiocarbon Dates of Some Archaeological Sites. Ackerman, Robert 1996 Spein Mountain. In American Beginnings: The Prehistory and Paleoecology of Beringia. Edited by Fredrick Hadleigh West, pp. 456-460. The University of Chicago Press. Adovasio, J. M., J. D. Gunn. J. Donahue, R. Stuckenrath, J. Guilday and K. Lord 1978 Meadowcroft Rockshelter. In Early Man in America From a Circum-Pacific Perspective. Edited by Alan Lyle Bryan, pp. 140-180. Occasional Papers No. 1 of the Department of Anthropology, University of Alberta. Adovasio, J. M., J. Donahue, and R. Stuckenrath 1990 The Meadowcroft Rockshelter Radiocarbon Chronology 1975-1990. American Antiquity 55:348-354. Adovasio, J. M., and D. R. Pedler 1997 Monte Verde and the Antiquity of Humankind in the Americas. Antiquity 71:573-580. Bonnichsen, Robson, Russell W. Graham, Timothy Geppert, James S. Oliver, Sheryl G. Oliver, Douglas Schnurrenberger, Robert Stuckenrath, Alice Tratebas, and David E. Young 1996 False Cougar and Shield Trap Caves, Pryor Mountains, Montana. National Geographic research 2(3):276-290. Bonnichsen, Robson, and Alan L. Schneider 1999 Breaking the Impasse on the Peopling of the Americas. In Ice Age People of North America. Edited by Robson Bonnichsen and Karen Turnmire, pp. 497-519. Oregon State University Press, Corvallis. Bonnichsen, Robson, and Karen Turnmire 1999 An Introduction to the Peopling of the Americas. In Ice Age People of North America. Edited by Robson Bonnichsen and Karen Turnmire, pp. 1-26. Oregon State University Press, Corvallis. Bryan, Alan L. and Donald R. Tuohy 1999 Prehistory of the Great Basin/Snake River Plain to about 8,500 Years Ago. In Ice Age People of North America. Edited by Robson Bonnichsen and Karen Turnmire, pp. 249-263. Oregon State University Press, Corvallis. Browman, David L. 1980 Early Native Americans. Prehistoric Demography, Economy, and Technology. Mouton Publishers, The Hague. Cinq-Mars, Jacques and Richard E. Morlan 1999 Bluefish Caves and the Old Crow Basin: A New Rapport. In Ice Age People of North America. Edited by Robson Bonnichsen and Karen Turnmire, pp. 200-212. Oregon State University Press, Corvallis. Cook, John P. 1996 Healy Lake. In American Beginnings: The Prehistory and Paleoecology of Beringia. Edited by F. H. West, p. 323-327. The University of Chicago Press. Derevanko, Anatoliy P. 1978 On the Migration of Ancient Man from Asia to America in the Pleistocene Epoch. In Early Man in America From a Circum-Pacific Perspective. Edited by Alan Lyle Bryan, pp. 70-71. Occasional Papers No. 1 of the Department of Anthropology, University of Alberta. Derevanko, Anatoliy P. 1996 Late Pleistocene Sites of the Selemdga River Basin. In American Beginnings: The Prehistory and Paleoecology of Beringia. Edited by Fredrick Hadleigh West, pp. 251-267. The University of Chicago Press. Derevanko, Anatoliy P. 1998 The Paleolithic of Siberia. New Discoveries and Interpretations. University of Illinois Press, Urbana. Dikov, N. N. 1978 Ancestors of paleo-Indians and proto-Eskimo-Aleuts in the Paleolithic of Kamchatka. In Early Man in America From a Circum-Pacific Perspective. Edited by Alan Lyle Bryan, pp. 68-69. Occasional Papers No. 1 of the Department of Anthropology, University of Alberta. Dikov, Nikolai N. 1996 The Ushki Sites, Kamchatka Peninsula. In American Beginnings: The Prehistory and Paleoecology of Beringia. Edited by Fredrick Hadleigh West, pp. 244-250. The University of Chicago Press. Dillehay, Tom D. 1989 Monte Verde: A Late Pleistocene Settlement in Chile. Smithsonian Institution Press, Washington and London. Dillehay, Tom D. 1999 The Late Pleistocene Cultures of South America. Evolutionary Anthropology 7(6):206-216. Dumond, D. E. 1980 The Archaeology of Alaska and the Peopling of the Americas. Science 209:984. Fiedel, Stuart J. 1992 Prehistory of the Americas. Cambridge University Press, Cambridge. Fladmark, Knut R. 1983 Times and places: Environmental Correlates of Mid-to-Late Wisconsinian Human Population Expansion in North America. In Early Man in the New World. Edited by Richard Shutler, Jr., pp. 13-41. Sage Publications, Beverly Hills, California. Frison, George C., and Robson Bonnichsen 1996 The Pleistocene-Holocene Transition on the Plains and Rocky Mountains of North America. In Humans at the End of the Ice Age: The Archaeology of the Pleistocene-Holocene Transition. Edited by Lawrence Guy Straus, Berit Valentin Eriksen, Jon M. Erlanson and David R. Yesner, pp. 303-318. Plenum, New York and London. Gibbons, Ann 1996 The Peopling of the Americas. Science 274:31-33. Goebel, Ted, W. Roger Powers, Nancy H. Bigelow, and Andrew S. Higgs 1996 Walker Road. In American Beginnings: The Prehistory and Paleoecology of Beringia. Edited by Fredrick Hadleigh West, pp. 356-363. The University of Chicago Press. Goodyear, Albert C. 1999 The Early Holocene Occupation of the Southeastern United States. In Ice Age People of North America. Edited by Robson Bonnichsen and Karen Turnmire, pp. 432-481. Oregon State University Press, Corvallis. Greenberg, Joseph H., Christy G. Turner II, and Stephen L. Zegura 1986 The Settlement of the Americas: A Comparison of the Linguistic, Dental and Genetic Evidence. Current Anthropology 27(5):477-497. Gruhn, Ruth 1987 Linguistic Evidence in Support of the Coastal Route of Earliest Entry into the New World. Man 23:77-100. Hamilton, Thomas D. and Ted Goebel 1999 Late pleistocene peopling of Alaska. In Ice Age People of North America. Edited by Robson Bonnichsen and Karen Turnmire, pp. 156-199. Oregon State University Press, Corvallis. Haury, Emil H., E. B. Sayles, W. W. Wasley, E. A. Antevs, and J. F. Lance 1959 The Lehner Mammoth site. American Antiquity 25:2-42. Haynes, C. Vance Jr. 1980 The Clovis Culture. Canadian Journal of Anthropology 1(1):115-121. Haynes, C. Vance Jr. 1987 Clovis Origin Update. The Kiva 52(2):83-93. Hoffecker, John F. 1996 Moose Creek. In American Beginnings: The Prehistory and Paleoecology of Beringia. Edited by Fredrick Hadleigh West, pp. 363-366. The University of Chicago Press. Hoffecker, John F., W. Roger Powers and Nancy H. Bigelow 1996 Dry Creek. In American Beginnings: The Prehistory and Paleoecology of Beringia. Edited by Fredrick Hadleigh West, pp. 343-352. University of Chicago Press, Chicago. Hoffecker, John F., W. Roger Powers and Ted Goebel 1993 The Colonization of Beringia and the Peopling of the New World. Science 259:46-53. Holen, Steven R. 1996 The Lovewell Mammoth: A Late Wisconsinan Site in North-Central Kansas. Current Research in the Pleistocene 13:69-70. Holmes, Charles E. 1996 Broken Mammoth. In American Beginnings: The Prehistory and Paleoecology of Beringia. Edited by Fredrick Hadleigh West, pp. 312-318. University of Chicago Press, Chicago. Holmes, Charles E., Richard VanderHoek, and Thomas E. Dilley 1996 Swan Point. In American Beginnings: The Prehistory and Paleoecology of Beringia. Edited by Fredrick Hadleigh West, pp. 319-323. University of Chicago Press, Chicago. Ikawa-Smith, Fumiko 1982 The Early Prehistory of the Americas as seen from Northeast Asia. In Peopling of the New World. Edited by Jonathan Ericson, R. E. Taylor, and Rainer Berger, pp. 15-33. Ballena Press Anthropological Papers No. 23, Ballena press, Los Altos, California. Jennings, Jesse D. 1978 Origins. In Ancient Native Americans. Edited by Jesse D. Jennings, pp. 1-41. W. H. Freeman, San Francisco. Kunz, Michael L., and Richard E. Reanier 1994 Paleoindians in Beringia: Evidence from Arctic Alaska. Science 263:660-662. Kunz, Michael L., and Richard E. Reanier 1996 The Mesa Site, Iteriak Creek. In American Beginnings: The Prehistory and Paleoecology of Beringia. Edited by Fredrick Hadleigh West, pp. 497-504. The University of Chicago Press. Laughlin, W. S. and A. B. Harper 1988 Peopling of the Continents: Australia and America. In Biological aspects of human migration. Edited by C. G. N Mascie-Taylor and G. W. Lasker, pp. 14-40. Cambridge University Press, Cambridge. Lorenzo, Jose Luis, and Lorena Mirambell 1999 The Inhabitants of Mexico During the Upper Pleistocene. In Ice Age People of North America. Edited by Robson Bonnichsen and Karen Turnmire, pp. 482-496. Oregon State University Press, Corvallis. Meltzer, David J. 1993 Pleistocene Peopling of the Americas. Evolutionary Anthropology 1:157-169. Meltzer, David J. 1995 Clocking the First Americans. Annual Review of Anthropology 24:21-45. Miller, Susanne J. 1982 The Archaeology and Geology of an Extinct Megafauna/Fluted-Point Association at Owl Cave, the Wasden Site, Idaho: A Preliminary Report. In Peopling of the New World. Edited by Jonathan Ericson, R. E. Taylor, and Rainer Berger, pp. 81-95. Ballena Press Anthropological Papers No. 23, Ballena press, Los Altos, California. Mochanov, Yuri A. 1978a Stratigraphy and Absolute Chronology of the Paleolithic of Northeast Asia According to the Work of 1963-1973. In Early Man in America From a Circum-Pacific Perspective. Edited by Alan Lyle Bryan, pp. 54-66. Occasional Papers No. 1 of the Department of Anthropology, University of Alberta. Mochanov, Yuri A. 1978b The Paleolithic of Northeast Asia and the Problem of the First Peopling of America. In Early Man in America From a Circum-Pacific Perspective. Edited by Alan Lyle Bryan, p. 67. Occasional Papers No. 1 of the Department of Anthropology, University of Alberta. Mochanov, Yuri A. 1980 Early Migrations to America in the Light of Study of the Dyuktai Paleolithic Culture in Northeast Asia. In Early Native Americans: Prehistoric Demography, Economy, and Technology. Edited by David L. Browman, pp. 174-177. Mouton, The Hague. Mochanov, Yuri A. and Svetlana Fedoseeva 1996a Berelekh, Allakhovsk Region. In American Beginnings: The Prehistory and Paleoecology of Beringia. Edited by Fredrick Hadleigh West, pp. 218-221. The University of Chicago Press. Mochanov, Yuri A. and Svetlana Fedoseeva 1996b Ust-Mil 2. In American Beginnings: The Prehistory and Paleoecology of Beringia. Edited by Fredrick Hadleigh West, pp. 525-536. The University of Chicago Press. Rogers, R. A., L. A. Rogers, and L. D. Martin 1992 How the Door Opened: The Peopling of the New World. Human Biology 64(3):281-302. Schanfield, Moses S. 1992 Immunoglobulin Allotypes (GM and KM) Indicate Multiple Founding Populations of Native Americans: Evidence of at Least Four Migrations to the New World. Human Biology 64(3):381-402. Szathmary, Emöke J. E. 1986 Comments. Current Anthropology 27(5):490-491. Taylor, R. E. 1991 Frameworks for Dating the Late Pleistocene Peopling of the Americas. In The First Americans: Search and Research. Edited by Ton D. Dillehay and David J. Meltzer, pp. 77-111. CRC Press, Boca Raton, FL. Torroni, Antonio, Rem I. Sukernik, Teodore G. Schurr, Yelena B Starikovskaya, Margaret F. Cabell, Michael H. Crawford, Anthony G. Comuyzzie, and Douglas C. Wallace 1993 mtDNA Variation of Aboriginal Siberians Reveals Distinct Genetic Affinities with Native Americans. American Journal of Human Genetics 53:591-608. Toth, Nicholas 1991 The Material Record. In The First Americans: Search and Research. Edited by Ton D. Dillehay and David J. Meltzer, pp. 53-76. CRC Press, Boca Raton, FL. Turner, Christy G., II 1985 The dental search for Native American origins. In Out of Asia: Peopling the Americas and the Pacific. Edited by Robert Kirk and Emöke Szathmary, pp. 31-78. The Journal for pacific History, Canberra, Australia. Turner, Christy G., II 1994 Relating Eurasian and Native American Populations Through Dental morphology. In Method and Theory for Investigating the Peopling of the Americas. Edited by R. Bonnichsen and D. G. Steele, pp. 131-140. Center for the Study of the First Americans. Oregon State University, Corvallis, OR. Wallace, Douglas C., and Antonio Torroni 1992 American Indian Prehistory as written in the Mitochondrial DNA: A Review. Human Biology64(3):403-416. West, Frederick Hadleigh 1975 Dating the Denali Complex. Arctic Anthropology 12:76-81. West, Frederick Hadleigh 1981 The Archaeology of Beringia. Columbia University Press, New York. Wyckoff, Don. G., Brian J. Carter, Wakefield Dort Jr., G. Robert Brakenridge. Larry D. Martin, James L. Theler, and Larry C. Todd 1990 Northwestern Oklahomas Burnham Site: Glimpses Beyond Clovis? Current Research in the Pleistocene 7:60-63. Yesner, David R. 1996 Environments and Peoples at the Pleistocene-Holocene Boundary in the Americas. In Humans at the End of the Ice Age: The Archaeology of the Pleistocene-Holocene Transition. Edited by Lawrence Guy Straus, Berit Valentin Eriksen, Jon M. Erlanson and David R. Yesner, pp. 243-254. Plenum, New York and London. Cite as: 2002 by James Q. Jacobs, http://www.jqjacobs.net/anthro/paleoamerican_origins.html. Your comments, etc. will be appreciated. Contact. ©2002 James Q. Jacobs. All rights reserved. Inquiries welcomed. Extinct fauna image courtesy Museo Nacional de Antropología, Mexico City. Mysterious link emerges between Native Americans and people half a globe away.